AATP Clockwork Aristo Kitty items now in stock! Just a quick heads-up, because this has been one of our most popular series in a while - we've just received various items in the Clockwork Aristo Kitty print series from Alice and the Pirates! This series features cute kitties frolicking over the gears of giant mechanical clocks, set against a diamond pattern background. We've sold out of many items on reserve but we do still have both versions of the jumper skirt as well as the skirt and socks in various colorways. Check out our New Arrivals page before it all sells out! 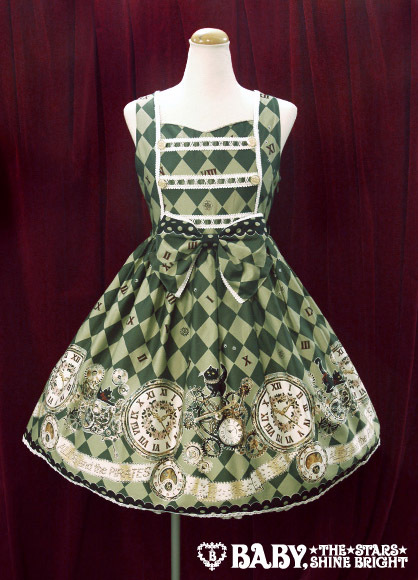 Victorian maiden's "Regimental Stripe" series for 2013 items now available for reserve! Victorian maiden's perennially popular regimental stripe items for 2013 are now available for reserve, with new items and new colorways in the popular and elegant traditional stripe motif! Reservations officially start on June 21st, but you can submit your requests starting now. This will help ensure that you get exactly what you want. As always, we cannot guarantee that we can get enough of any particular item until we have confirmation from BTSSB, but ordering early puts you higher on the list. Victorian maiden Beth items up for reserve! Today we've got a couple items from VM's casual brand Beth up for reserve! And two new pairs of tights from the main VM brand. We will need to confirm individual orders. Baby, the Stars Shine Bright in Times Square, NYC! This past weekend, Baby, the Stars Shine Bright was in the area for the AnimeNEXT convention in Somerset, NJ. Some of you probably saw them there! On Monday we spent some time with them in the city, and we just wanted to share this photo from Times Square. From left to right, that's company founder Akinori Isobe and designers Masumi Kanou and Saki Tachibana. It was a little too bad about the weather, but we all had fun anyway and we hope to see them again soon. Watch our blog for "Sleeping Beauty" series items a little later today! We've got a quick round of eight items up for reserve from Victorian maiden, including the Elegant Lacy series! Unfortunately, the Noble Black colorways of the Victorian Queen Dress and Victorian Queen Heart Frill Dress are not available.